These containers are perfect for most types of opal--rough, cabs, or tumbled. 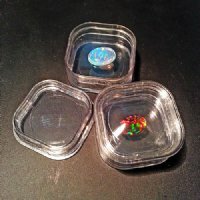 Originally designed to hold high-end faceted gemstones, these "floating" gem containers have two durable, clear plastic membranes that hold your opals in place once the container is closed. Suspended in the box, any opal can be seen from all angles. The membranes have quite a bit of give and wrap around the opal(s), keeping them safe and stable. If you look closely at the picture, you can see the opal resting on the clear plastic. The containers are 35mm x 35mm x 15mm. FYI, these also make great containers for holding and displaying milli slices.